Huge Wave Of Syrian Refugees Possible; Thousands Stuck At Turkish Border : The Two-Way Turkey and Jordan say they're dealing with tens of thousands of Syrian refugees and don't have the capacity to help them all. 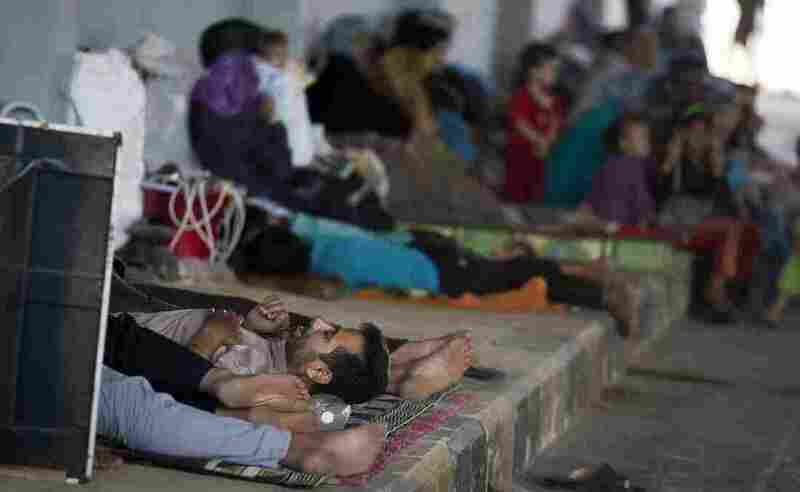 Syrians wait on the Syrian side of the border to be admitted to Turkey on Wednesday, Aug. 15. As fighting in Syria continues to spread and worsen, more Syrian civilians are trying to get out of their country. They've essentially got four choices: Lebanon, Jordan, Iraq and Turkey. Turkey and Jordan have taken the greatest flood of people. The U.N estimates that 5,000 people arrive at Turkey's border every day seeking protection. There are several camps to house them but people are coming faster than places can be built to receive them. Refugees are also getting help from Turkey's Red Crescent Society. Turkish officials think as many as 10,000 Syrians may now be waiting to cross the border, according to AP. They'll be taken in as soon as a new camp is finished. Jordanian officials say they've taken in 150,000 people, according to Al Jazeera. Their reporter, Jane Ferguson, visited one camp teeming with 15,000 refugees. Both Jordan and Turkey are insisting they need more international help; Jordanian government spokesman Samih Maitah says while Jordan won't turn its back on Syrians in need, his country can't afford this anymore. The U.N. says the Syrian border crossing with Iraq closed August 16 and the number of Syrian refugees is steady, at nearly 16,000. And in Lebanon, there are about 51,000 Syrian refugees. The numbers there are lower as fighting linked to the Syrian conflict erupts. U.N. officials told Reuters the violence in Lebanon is interfering with the work they're doing with refugees. A U.N. office briefly opened in Tripoli to register Syrian refugees but it closed for security reasons.